The Solar Dynamics Observatory (SDO) captured this image of the sun during an M6.1 flare that peaked at 7:44 AM EDT on July 5, 2012. The image is shown in the 304 Angstrom wavelength, which is typically colorized in red. 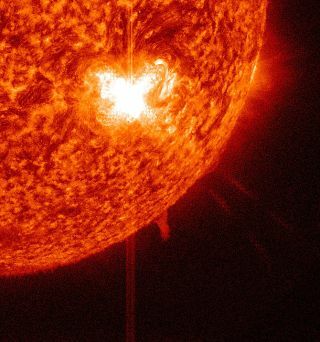 The sun fired off yet another intense solar flare today (July 5), the latest in a series of storms from a busy sunspot being closely watched by space telescopes and astronomers. NASA's Solar Dynamics Observatory snapped a daunting new image of a strong M-class solar flare that peaked this morning at 7:44 a.m. EDT (1144 GMT). The M6.1 flare triggered a moderate radio blackout that has since subsided, according to officials at NASA and the National Oceanic and Atmospheric Administration (NOAA). The eruption came from a sprawling sunspot, called Active Region 1515, which has been particularly dynamic this week. In fact, the sunspot region has now spewed 12 M-class solar flares since July 3, NASA officials said in a statement today. The sunspot region is huge, stretching more than 62,137 miles long (100,000 kilometers) in length, they added. This sunspot region has also produced several coronal mass ejections (CMEs), which are clouds of plasma and charged particles that are hurled into space during solar storms. Powerful CMEs have the potential to disrupt satellites in their path and, when aimed directly at Earth, can wreak havoc on power grids and communications infrastructure. But, the sunspot is slowly rotating toward Earth, and scientists are still monitoring its activity. "Stay tuned for updates as Region 1515 continues its march across the solar disk," officials at the Space Weather Prediction Center, a joint service of NOAA and the National Weather Service, wrote in an update. X-class solar flares are the strongest sun storms, with M-class flares considered medium-strength, and C-class the weakest. Today's M6.1 eruption is a little over half the size of the weakest X-class flare, NASA officials said. Radio blackouts can occur when a layer of Earth's atmosphere, called the ionosphere, is bombarded with X-rays or extreme ultraviolet light from solar eruptions. Disturbances in the ionosphere can change the paths of high and low frequency radio waves, which can affect information carried along these channels. Radio blackouts are categorized on a scale from R1 (minor) to R5 (extreme). An R2 radio blackout can result in limited degradation of both high- and low-frequency radio communication and GPS signals, NASA officials said. The sun is currently in an active phase of its roughly 11-year solar weather cycle. The current cycle, known as Solar Cycle 24, is expected to peak in mid-2013.